To start college out right, you need to be organized. Sure you need to keep your clothes and shoes organized, but beyond that the most important dorm organization involves your classes. You cannot go to college without a dorm calendar. Why? Well you obviously want to succeed in college. One of the ways to do that is to keep track of your classes! With so much going on in college, it can be easy to lose track of what is due and what you need to study for. 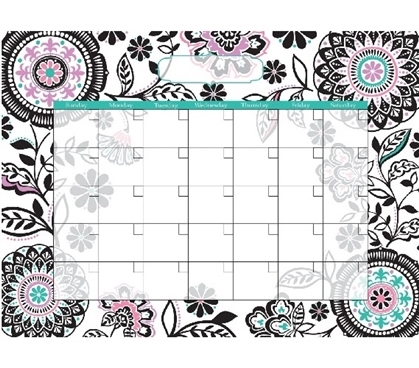 Stay organized with our Peel N Stick Floral Medley Wall Calendar Wall Art! Our Peel N Stick Floral Medley Wall Calendar Wall Art will help you keep track of what is due and what you need to study for on a monthly basis. You may not want a calendar that shows anything beyond a month because you may become overwhelmed with what you have to do. With this dorm wall art calendar, you can fill in the dates and important information only for the month that you are in. Plus as you finish those dorm essays and other college homework, you can simply erase them off the dorm message board and forget about them! Our Peel N Stick Floral Medley Wall Calendar Wall Art also adds to your dorm room decor while keeping you organized! The best college supplies do that. This Dorm Wall Art has a pretty black, aqua and purple border that will be a pretty addition to your college dorm room. It may even make you feel better about all of college essays you have to do!